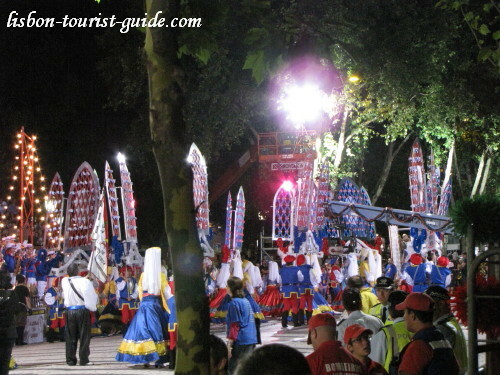 Welcome to the Festas Santos Populares - a full month of popular parties celebrating the people's saints. Who are these people's saints? 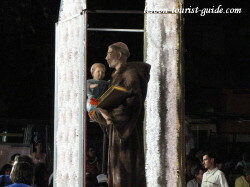 In the Festas Santos Populares, the celebrated people's saints are António, Pedro and João. 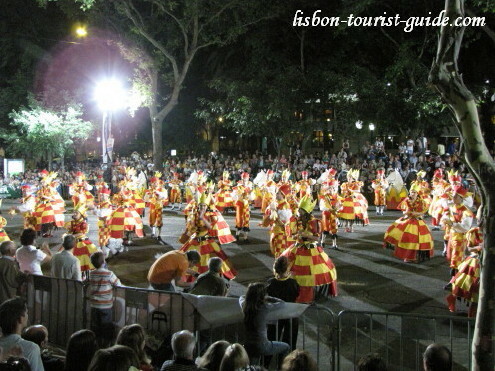 Saint António is one of the Lisbon's patrons. 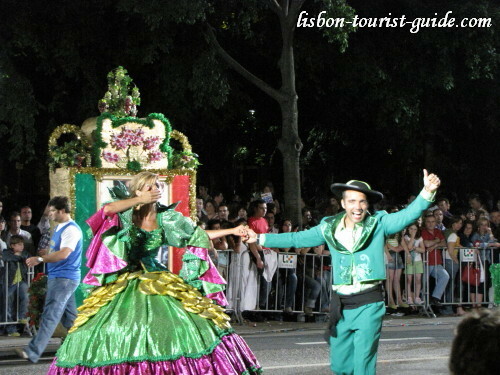 He's also the patron of all lovers and known as "Santo António Casamenteiro". According with the people's believe, this Saint helps the ones who seek a mate to get marry. 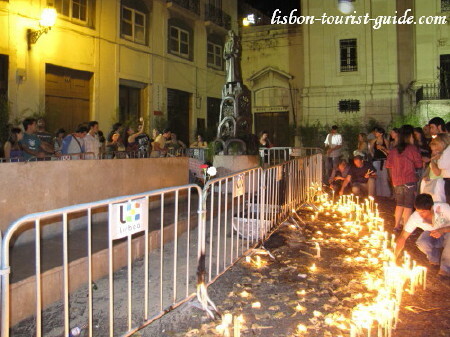 During this period is frequent to see candles (begging for his intercession) around the Saint Statue placed in front of the Church with his name on. 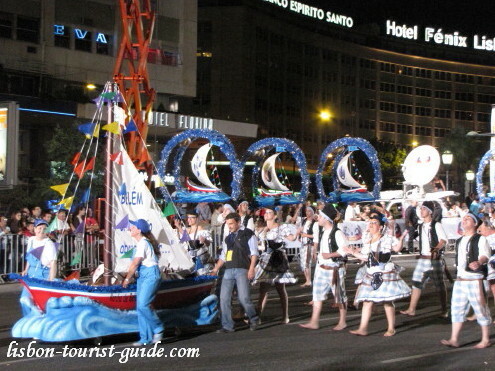 We celebrate the Santo António's day on the 13th of June - the city's official holiday. The day before (12), Lisbon watches the Marriages (Casamentos) of Santo António. In this day 13 couples get married with all the expenses being paid by the city council (Câmara Municipal). Lucky one's, don't you think? On the same day, but during the night, happens one of the highest points of the celebrations. 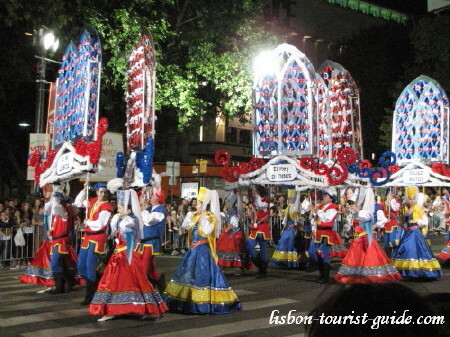 It's the Desfile das Marchas Populares, a colourful parade that inch down the Avenida da Liberdade. 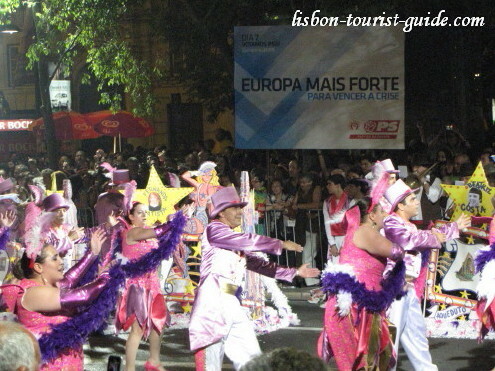 Each city old neighbourhood (Bairro) has a group representing that bairro competing for the best presentation. They come dressed in theme costumes and sing a song during the presentation. 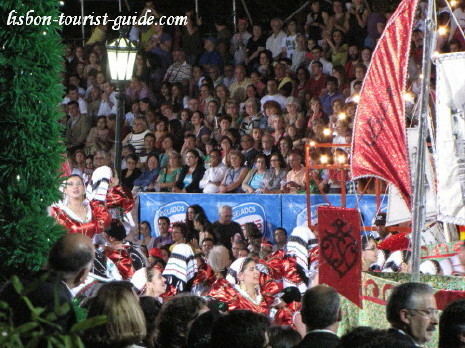 Often the songs talk about the bairro history, old traditions, the sea, the fishermen and the famous people born there. Some ten days earlier (more or less), the bairros have their presentation in the Pavilhão Atlântico. This is an opportunity for the judges to evaluate their performances more quietly. You see, when the parade is in the Avenue, the streets are absolutely crowded! This presentation is open to the general public as well. If you really like these Marchas Populares, you should attend. The winner receives fame and glory! And, believe me, this competition is a very big issue between the bairros because of the intense rivalry that you can easily sense and witness. I took some pictures to give you a glimpse of the action. But, it's definitely better to see it live in the Avenue. 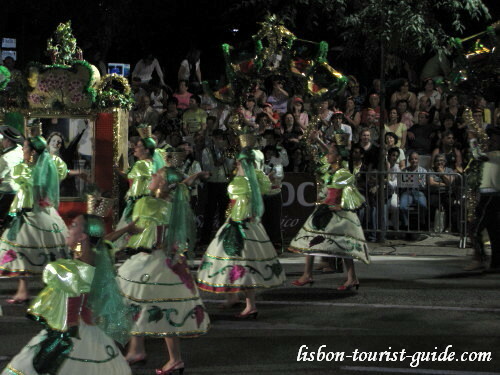 After the Marchas, Lisbon people (lisboetas) hold on an arraial in each bairro. 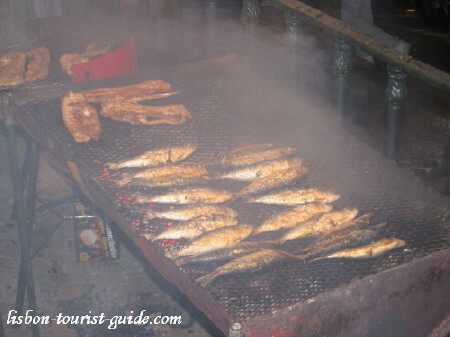 An arraial is a street party, where you can eat sardines (sardinhas) and drink sangria. 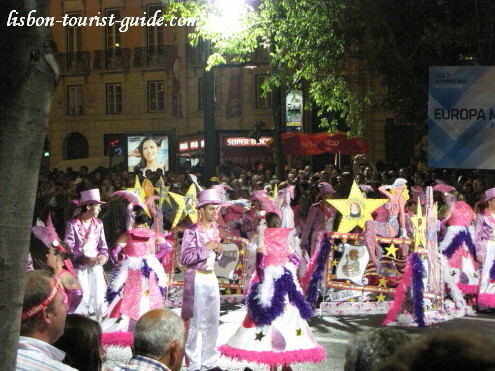 The most popular arraiais are in Alfama, Mouraria, Madragoa, Castelo and Sé. 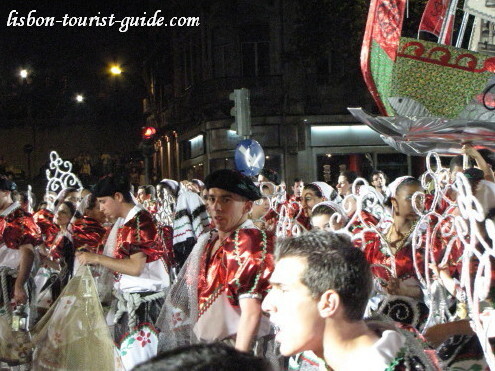 In the following day (13), there's a procession from the Igreja de Santo António (Saint António's Church) to the Sé (Cathedral). After the procession more candles are placed around his statue. 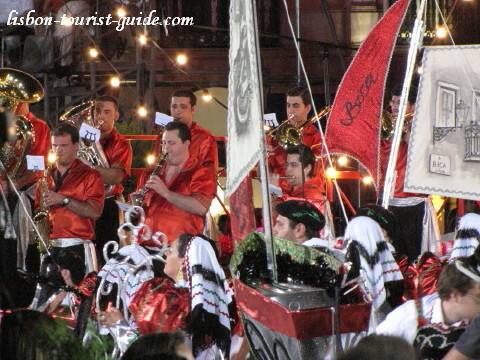 It's a tradition in the Festas Santos Populares to offer a small Basil Pot to the one you love during this period. Each one as a little paper attached with a corny poem. And you can find them everywhere! What about the other Saints? 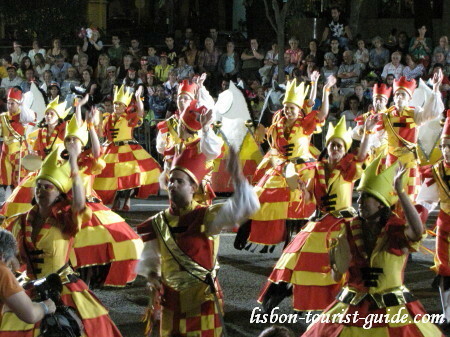 São João is celebrated more enthusiastically in Oporto. 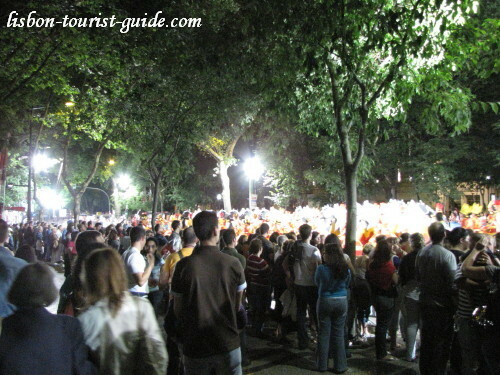 On this Saint Day's eve (23 June) a huge street rave-up is held in Oporto. It's a tradition to buy giant plastic hammers and use them to hit everybody's head. So, don't be surprised to be attacked by complete strangers. Also, bunches of garlic can equally be shoved right under you nose! Saint Pedro's day is in the 29th of June. Although there's no special party in his honour, he is equally considered a people's saint. Check out more photos bellow. 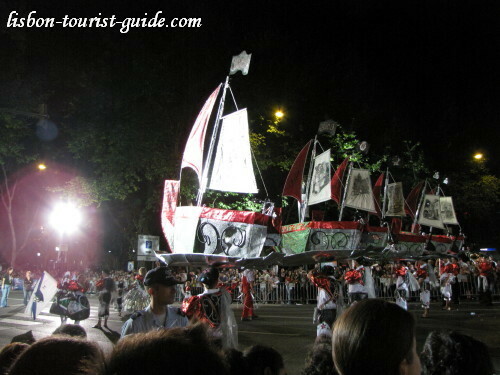 Don't forget to see the Arraiais Populares, an important part of the Festas Santos Populares!